Saskatoon has more than 200 parks. With so much green space available, you’re bound to find a swatch to spread out your picnic blanket for a snack. Set the kids free in a playground or get in a game of frisbee golf. From tennis courts to skateboard parks, swimming pools to splash pads, a park tour is a great way to pass a Saskatoon afternoon. The Meewasin Valley Authority (MVA) manages the more than 6,700 hectares (which, if you know hectares is a lot!) of land along the South Saskatchewan River Valley, including Saskatoon’s river banks. 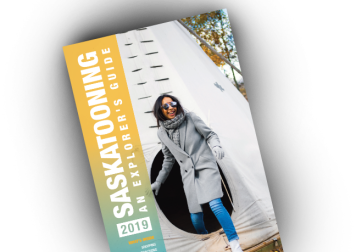 This is where you’ll spot beautiful natural vegetation (crocus spotting after the winter freeze is a hobby some Saskatonians partake in with great enthusiasm) and wildlife. Throughout the city the MVA maintains trails above and below the valley, perfect for hiking and biking adventures. They also have an interactive online map for self-guiders: https://meewasin.com/map/. It’s not only the largest piece of native grasslands in the area but the Meewasin Northeast Swale also contains vast wetlands and a large variety of plant and animal species. Short-eared owls reside there and sharp-tailed grouse use the area as a mating ground. The Northeast Swale is open to the public. The MVA often welcomes visitors to the site at different points in the year to learn about the swale’s history from experts in the field. Beaver Creek (aptly names cause hey – there are beavers!) and Cranberry Flats conservation areas, both mere minutes south of the city, are natural prairie paradises. Watch the river pass by, wave to kayakers and be sure to snap a #saskatooning Insta pic at sunset. Saskatoon Natural Grasslands is in the northeast corner of the city. Here, a 34-acre parcel of preserved fescue grassland awaits your photographic imagination. Marvel at the complex ecosystem of grasses, flowers, plants, birds, animals and insects. If you’re a bird-watcher, you’ll want to head to Cosmopolitan Park and Lookout for the best site in the city to spot the winged wonders. Songbirds fill the area during spring and fall migrations, while in the winter you might see golden-eye or bufflehead ducks. Beavers and muskrats ply the waterways in the evenings.